Vivid and touching, vibrant reds and serene whites blend in honor and celebration of a life filled with love, light and grace. • Beautiful fresh flowers such as red gladioli and carnations with white asiatic lilies set amidst myrtle, sword fern, and salal in an exclusive Noble Heritage Urn. 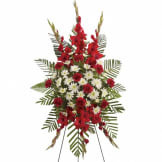 • Arrangement measures approximately 24" W X 34" H.
Flowers will be received by a Tunison Funeral Home's staff. The Flowers were just beautiful. We thought they were one of the most attractive flowers displayed. 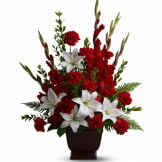 We heard many comments about the arrangement. 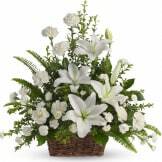 The arrangement was the perfect size and taste for a respected revered veteran. Thank you. Flowers were beautiful and exactly what the picture looked like. It was delivered at time promised. I talked to representative day after I placed the order, because I forgot to put a ribbon on it with Dear Aunt and also did not have enough space to put all the nieces and nephews names on it space provided. When I talked to representative, she was going to have the ribbon added and I gave her all additional names to put on card. When we were at funeral home, no ribbon was added and we had to write all additional names on the card. But flowers were beautiful. 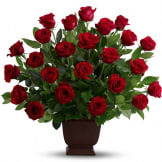 All of our flowers are designed and delivered by hand from a local florist in in Saratoga Springs.